This gentleman was referred to our clinic for a keloid growth that had worsened after prior plastic surgery excision. The tumor was excised under local anesthesia, repaired with low-inflammation monofilament sutures, and treated with adjuvant intralesional steroid injections into the area of scar. The postoperative photograph shows a satisfactory cosmetic result without recurrence of the keloid scar 6 months post-surgery. This patient was treated for a squamous cell carcinoma in situ of the cheek. The surgical defect was closed with a linear repair. 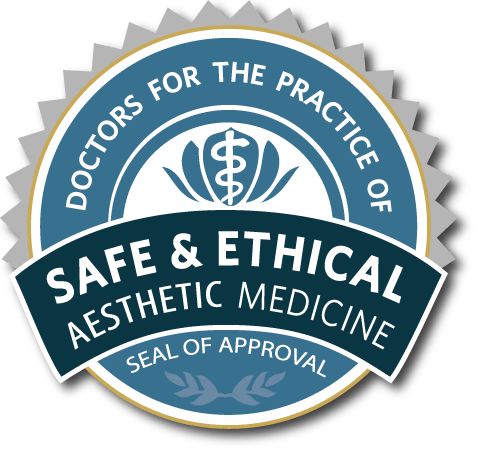 Unique to our surgical technique is the use of fractional ablative laser starting at the time of surgery and continuing as needed every 30 days. 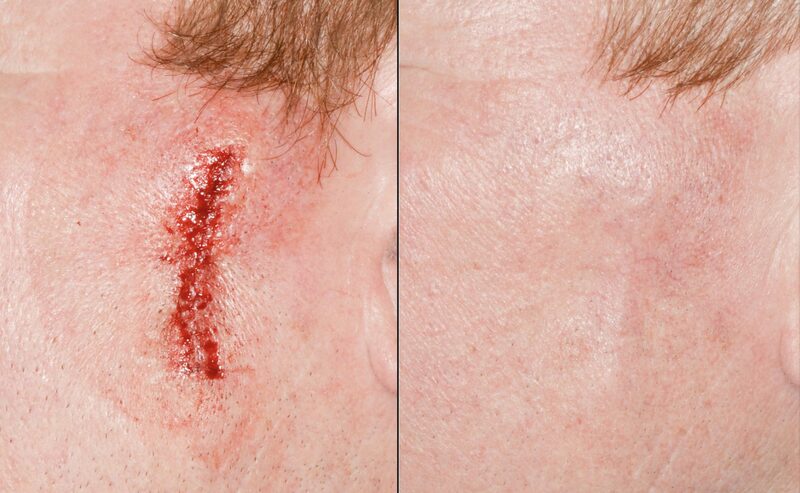 The patient shown here is 30 days out from his procedure with minimal visible scar. The subtle ‘ridge-like’ projection of the repair is by design. It will completely flatten out over the coming months. 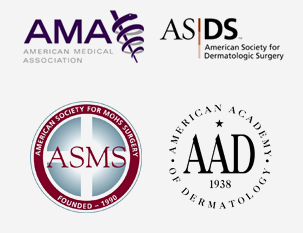 While there is no way to perform surgery without leaving a scar, our patients typically enjoy a very rapid recovery with excellent cosmetic outcomes. This patient was treated for a squamous cell carcinoma of the temple. The surgical defect was closed with a linear repair. Unique to our surgical technique is the use of fractional ablative laser starting at the time of surgery and continuing for 90 days. The patient shown here is 60 days out from her procedure with minimal visible scar. While there is no way to perform surgery without leaving a scar, our patients typically enjoy a very rapid recovery with excellent cosmetic outcomes. This patient was treated for a squamous cell carcinoma of the finger with Mohs surgery. A rhombic flap was used to repair the resulting defect. 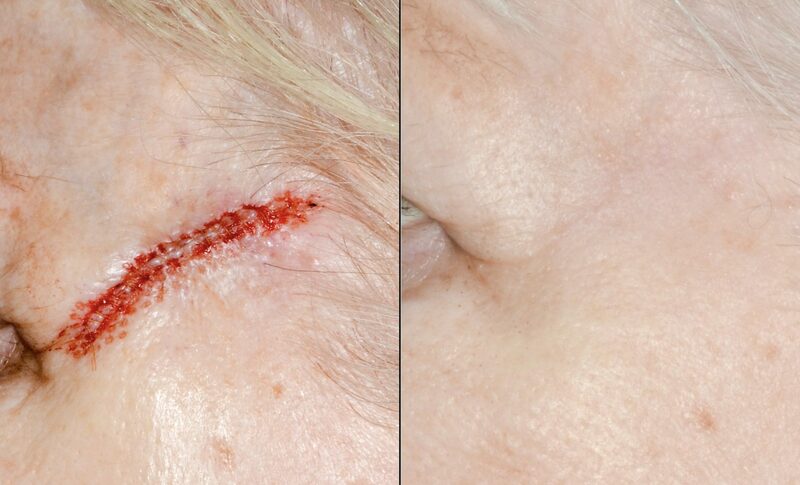 The final photograph shows a well healed surgical wound at post-operative day 90. 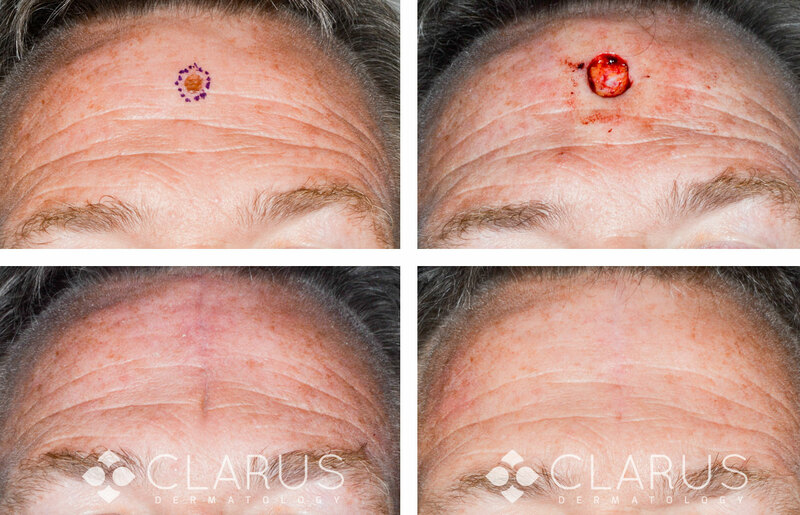 This patient was treated for a basal cell carcinoma of the forehead with Mohs surgery. Primary closure leaves minimal visible scar at post-operative day 90. All of our surgical patients receive laser resurfacing at no additional charge to minimize the appearance of the surgical scar. 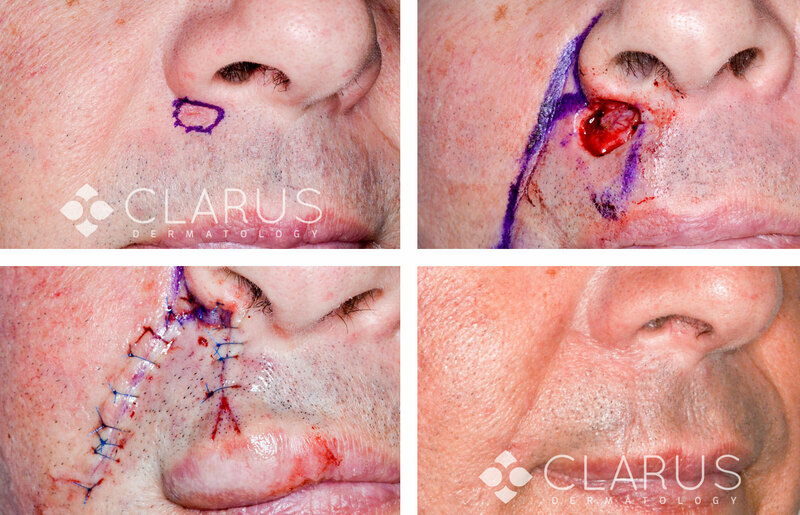 After clearance of a basal cell carcinoma with Mohs surgery the resulting defect was reconstructed using a flap. The postoperative result shows no distortion of the ala, cheek/lip junction or lip border at day 90. 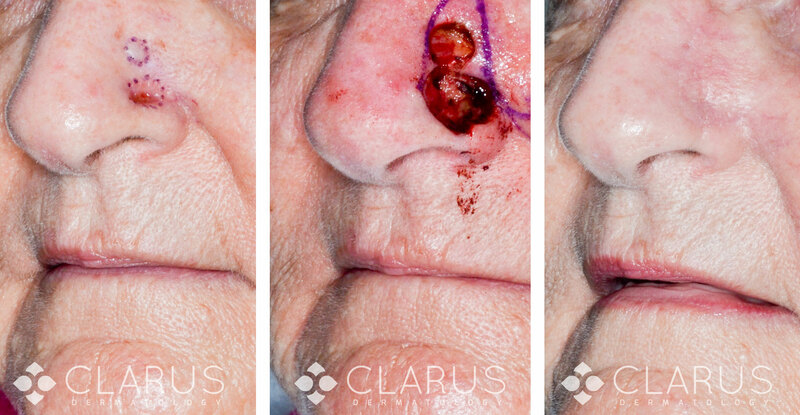 Our patient had two separate but closely spaced basal cell carcinomas on her nose. The tumors were cleared with Mohs surgery. The resulting defect was closed with a single-stage cheek advancement flap. The patient enjoys normal breathing through the right nostril, excellent postoperative nasal symmetry, minimal distortion of the cheek/nose/lip junction and a very fine scar-line. 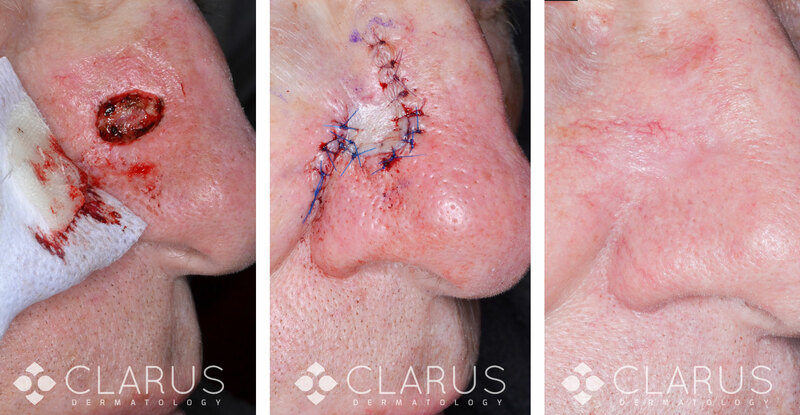 In this case, a basal cell carcinoma of the nose is cleared with Mohs surgery and subsequently repaired with an advancement flap. At day 90 minimal scar is visible; there is no distortion of the ala or reduced nasal valve function.